C1602. 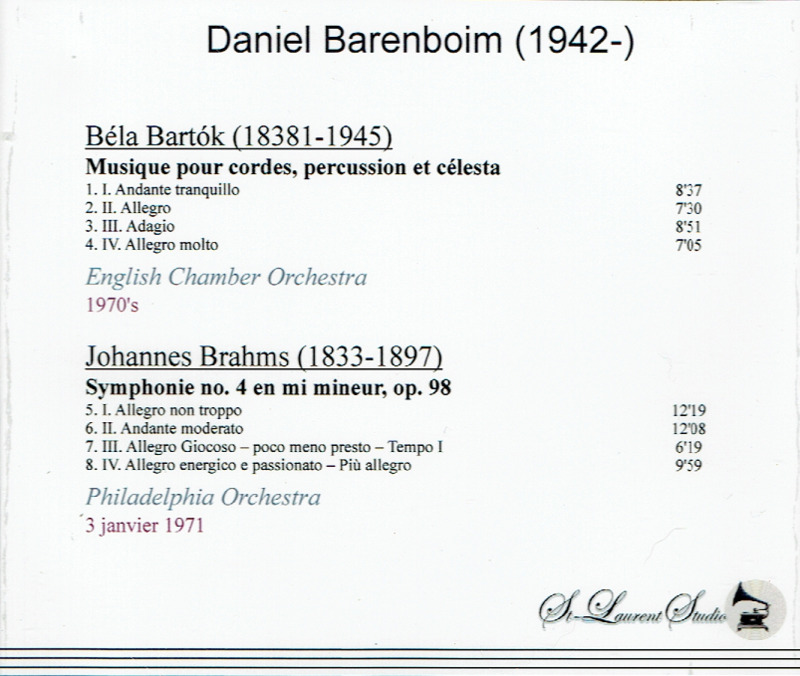 DANIEL BARENBOIM Cond. Philadelphia Orch. 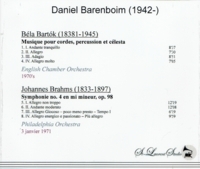 : Symphony #4 in e (Brahms), Live Performance, 3 Jan., 1971; DANIEL BARENBOIM Cond. English Chamber Orch. : Music for Strings, Percussion and Celesta (Bartok), Live Performance, 1970s. (Canada) St Laurent Studio YSL T-700. Transfers by Yves St Laurent. "Daniel Barenboim was born in Buenos Aires on November 15, 1942, into a family of Ukrainian Jewish descent. Daniel's mother was his first piano teacher; he later studied with his father, Enrique Barenboim, who was an eminent music professor. After playing for violinist Adolph Busch, who was impressed by his talent, Daniel made his debut recital at the age of seven. In 1951, he played at the Mozarteum in Salzburg and observed Igor Markevitch's conducting class. The family moved to Israel in 1952; two years later, Daniel went back to Salzburg for a conducting course with Markevitch, piano studies with Edwin Fischer, and chamber music performance with Enrico Mainardi. He studied conducting with Carlo Zecchi at the Accademia Musicale Chigiana in Siena, also attending Nadia Boulanger's music theory and composition class at Fontainebleau. His U.S. debut was at Carnegie Hall on January 20, 1957, in Prokofiev's Piano Concerto #1, with Leopold Stokowski conducting the Symphony of the Air. Debuts with leading orchestras included the London Symphony Orchestra (New York, 1968), Berlin Philharmonic (1969), and New York Philharmonic (1970). Since then he has guest conducted virtually all of the world's leading orchestras. In 1967, Barenboim married the brilliant cellist Jacqueline Du Pré, with whom he made several exceptional recital recordings. Unfortunately, this partnership ended when Du Pré contracted multiple sclerosis, which forced her to end her playing career in 1972. She died in 1987. In 1989 he was named as Sir George Solti's successor as music director of the Chicago Symphony Orchestra. In 1992, Barenboim became music director of the Berlin State Opera, then named chief conductor for life by its orchestra in 2002. In 1999, with Palestinian-American scholar Edward Said, Barenboim co-founded the West-Eastern Divan Orchestra, a summer youth orchestra designed to foster understanding and cooperation, and he established the Barenboim-Said Academy in Berlin. Devoted to the training of young Arab and Israeli musicians, the school opened in 2016. A recording of Beethoven's Symphony #9 by the West-Eastern Divan Orchestra appeared in 2013. 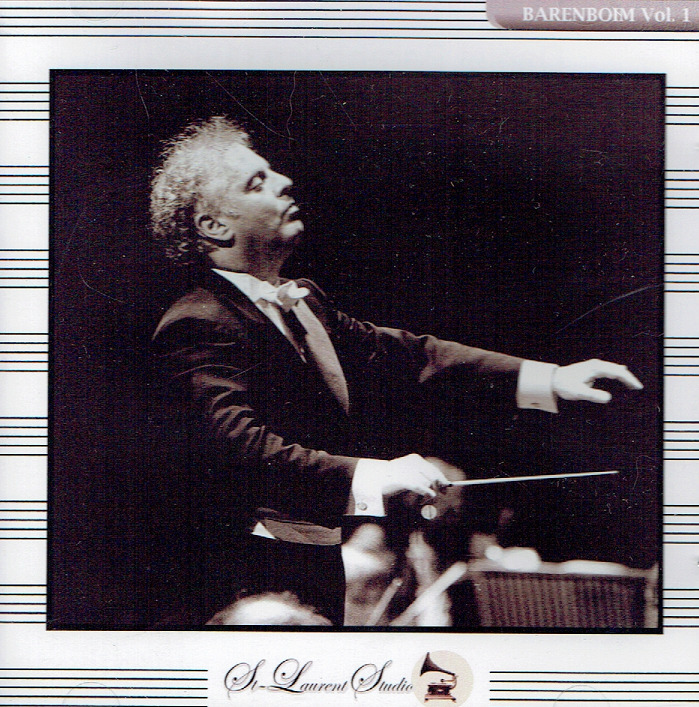 Barenboim has a rich recorded repertoire as a conductor, pianist, accompanist, and chamber music player. Interestingly, as a pianist, he tends to focus on Mozart, Beethoven, and the early Romantics, while as a conductor he favors later Romantic music, particularly Brahms and Bruckner (he has won a medal from the Bruckner Society of America."